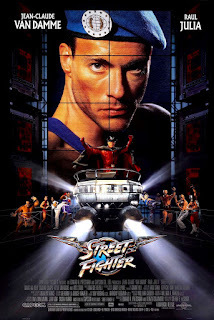 On this week's episode, the #SBE2016 enters Video Game Adaptation Country as the gang welcomes the titular Vinny Brusco of The Vinny Brusco Show to join in the rant against 1994's Street Fighter! What's with the severe lack of street fighting in the film? Why are Chun-Li, Balrog and E. Honda all working for a global news network? And what in the hell are they doing with Blanca's A Clockwork Orange set-up? PLUS: A certain someone could be in David Fincher movies, Marc! Street Fighter stars Jean-Claude Van Damme, Raul Julia, Ming-Na Wen, Damian Chapa, Kylie Minogue, Simon Callow, Byron Mann, Roshan Seth, Andrew Bryniarski, Grand L. Bush, Miguel A. Nuñez Jr., Wes Studi, and Peter Tuiasosopo; directed by Steven E. de Souza.